Feb. 26, 2016 - PRLog -- Bizwatch, a search & social marketing analytics company today announced its plans to participate in SMX, the leading conference for SEO and SEM professionals, March 1-3 in San Jose. Laura Thieme, Bizwatch founder and CEO, will speak at the conference, presenting two sessions. Bizwatch will also exhibit in booth #206. 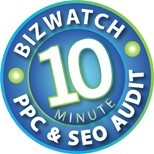 Conference attendees can take advantage of Bizwatch’s 10-minute PPC and SEO audit online, anytime, or at Bizwatch’s booth in-person. Conference attendees can find out which of their target keywords are most popular and if they rank in the top 3 organic listings at http://bizwatch.bizresearch.com/signup/SEOInfo. Attendees can also pull 60 days of historical Google AdWords data into Bizwatch’s PPC audit platform and discuss methods to improve their paid search and organic campaigns. Thieme founded her first search marketing company, Bizresearch, in 1997. Her marketing analytics software company, Bizwatch, evolved from Bizresearch, and was founded in 2010. Thieme has worked with major brands including TOMS Shoes, Burt’s Bees, U.S. Education Corp, CRE Rentals, M/I Homes, MicroCenter, Collin Street Bakery, Bozzuto, PetSupplies4Less, Levenger, Pier 1 Imports, SpaFinder.com, and JCWhitney Automotive. Thieme has presented at over 50 Search Engine Strategies (SES) & Search Marketing Expo (SMX) conferences around the world on integrated paid search and SEO trend analysis, campaign management, mobile advertising and keyword discovery. She’s been featured in The New York Times, Internet Retailer, TechNewsWorld, EcommerceTimes, CBS Marketwatch, New York Daily Post, Business First, Investor’s Business Daily, Columbus CEO, Columbus Dispatch, The Daily Reporter, MarketingSherpa, SearchDay, SearchEnginewatch.com and ClickZ.com. Thieme was named by her peers as one of the Top 100 Most Influential Marketers and a Top 10 PPC Expert. Bizwatch measures, trends, interprets and analyzes PPC, SEO and social media conversion data, through custom performance audits and monthly trend reports. Over 600 brands utilize its automated SEO & PPC reporting tool. Bizwatch assists mid-market companies with monthly advertising budgets of $50k or more with customer acquisition, increasing conversion rates and lowering cost per conversion. For more information on Bizwatch and its services, visit http://www.bizwatchsearchanalytics.com/.